Denis Diderot was a thinker of the Enlightenment whose rationalist thought and skepticism greatly contributed to Enlightenment society and our world today. He was a novelist, satirist and playwright. Through his written work, he criticized the morals of the times, and the hypocrisy of the nobility and some Church officials. Diderot was born in 1713 in Langres, France. Like many great thinkers, Diderot was educated by Jesuits. He started out in life in Paris in 1734 as a tutor and hack writer. These occupations did not pay him well. 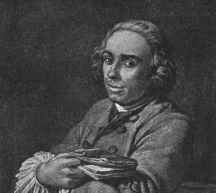 His first independant work was Essai sur le merite et la vertu which he published in 1745 anonymously. In 1746 he published Pensées Philosophiques, which was his first real philosophical work. He was set upon his most lasting contribution to the Enlightenment and the world in 1747 when he was invited to edit a French translation of the English Cyclopaedia by Ephraim Chambers in 1747. Diderot, working with his mathematically minded friend, d'Alembert, took the original task to a new level by collecting many thinkers work into a vast, new, and controversial 35-volume work. This work was called Encyclopédie ou dictionnaire raisonné des sciences, des arts et des metiers, but is commonly known as the Encyclopédie. This Encyclopedie was the work of the likes of Quesnay, Montesquieu, Voltaire, Rousseau, and Turgot. It was published between 1751 and 1775, and in 1780 a five volume supplement and a two volume index were added. Later in his life he gained the patronage of Catherine II of Russia. This helped him publish much of his writing. He also became friends with Mary Geoffrin and like her, held salons. It is believed that at the salons he hosted the predecessor of modern art criticism came into being. Diderot contributed much philosophical writing and thinking to the Enlightenment as well as the world's first real comprehensive encyclopedia.